As you can see from my 1987/88 diary and this blog football was a big part of my life from childhood. That’s one of the reasons people thinking they are a big influence on me late in life annoy me so much. I had a big thirty years of life before coming to Leeds, from being moved from Jersey to a damp one-parent family council flat where I became asthmatic to travelling to all the populated continents on a shoestring. I learnt a lot at university, and am still learning all the time, with my day-job good for technology and keeping me on my toes, balancing out my coffilosophy deep thought here. Some of the women have inspired some of my feminism, although only added to others before them, and some of my uni friends influenced my appreciation of the British countryside. I’d been hiking around the world before, but hadn’t bothered much in the U.K., trying to be as much of a ‘townie’ as possible when living in the countryside! I’m willing to provide appreciation and thanks to other people, but retract it if they take it the wrong way (such as sexually when it’s not), claim credit for my coffilosophical writing, or don’t consider themselves to have benefitted from knowing me (such as thinking themselves inherently above me). I think the ‘nice’ people have kept me on a ‘good path’, but sometimes think it’s the wrong one, and a dead end, and that I’d be better off deeply embedded with my ‘real demographic’. As I’ve written before I dropped out of school in the second year of secondary school, losing interest and increasing rebelliousness, becoming quite politically aware for my age, mixed with the country seeming in turmoil, especially for the working-class. I only wanted to be a footballer anyway, so didn’t think school had any benefit; especially as it was totally focused on rugby union, which I also enjoyed playing, but preferred football. Rather than schoolwork I preferred reading football and music papers and magazines, as well as The Unexplained: looking back, it’s probably a sign of ADHD, or maybe Asperger’s, having watched a Chris Packham (inspiration for greenYgrey nature correspondent Chris Packwolf!) documentary about his life with a mild form of it. I hope to focus more on that documentary in the near future. While the first inspiration for my writing goes back to my earliest teaching to read and write, and the books such as Rupert the Bear that probably influenced the greenYgrey, the first big influence was probably the comics I used to read, and during good storylines, used to wait eagerly in anticipation for the next thrilling episode. I still remember some of those characters. As ‘Hot Shot’ Lorimer played for Leeds, there was a Hamish ‘Hot Shot’ Balfour who played for Princes Park in Scotland; ‘Nipper’ Lawrence who grew up on the backstreets to play for Blackport and of course Roy Race of Melchester Rovers; I recently read the latter’s making another comeback! Growing up in south-west/mid Wales, everybody supports a big team, with Swansea the closest team to the town I lived in, fifty miles away. They were a lower league team in my childhood, so had no supporters amongst my age group that I knew; some had them as a ‘second team’, and took more interest when they reached Division One. There were lots of Leeds fans, as they were one of the biggest clubs, and as I was more into football than most, I considered myself a Division One Leeds supporter. However, as I played every weekend, I was just an armchair fan. That changed in the 1985/86 season when a friend with ties to the Swindon area asked if I wanted to go to the Swindon v Leeds F.A. Cup replay on February 3rd, 1986 (Footballsite date: I haven’t got a statto brain like a Leeds fan I saw on T.V. that can remember all such stats). I of course jumped at the chance, and four of us went to the game, which Leeds won 2-1 thanks largely to a heroic display by Mervyn Day in the Leeds goal. I left to travel in August, 1987, and was away for nearly four years apart from a couple of months. I was then home for about two and a half years, and saw a few Leeds games as they returned to the glory days for a few years under Howard Wilkinson. After returning in June, 1991, in the 1991-92 last Division One champions season I saw Leeds draw 1-1 at Everton on February 23rd and in my first game at Elland Road 0-0 at home to West Ham on March 28th (Wikipedia) (I’d remembered the Norwich game below as my first home one until now!). In the 1992-93 season I saw Leeds beat Manchester City 1-0 on March 13th (Premier League). We lost 0-4 to a great Norwich side on Saturday August 21st, 1993 in the 1993/94 season (Sky Sports), but then equalled it with a win, 4-0 v the Wimbledon crazy gang on October 3rd in the same season (Sky Sports). I left for the Americas later that autumn, and after returning the next autumn enrolled in an access course, and after completing it in 1995 was accepted by the University of Leeds. I had a season ticket the first year, but then started working there, and I think saw every game over the next decade, when there was lots of glory without quite winning anything, but I did go to Wembley to see the League Cup final in my first season, and the Champions League semi-final season. After gambling on regular Champions League football, and off-field distractions, there was unfortunately a big slump that has partially ended, with promotion from Division One to the Championship, and the early season was looking good, briefly leading the league, but not the last few games. I write this having already achieved a winning season for my 5 games minimum: winning 4-1 v Port Vale, 5-1 v Newport and 2-0 v Brum; I also had a ticket for the 5-0 win v Burton but a ferry cancellation meant I didn’t make it, but I was there in seat and spirit! Although I thought of myself as a Premier League Leeds supporter before arriving in the city, unfortunately I don’t feel like one any more, although I am still a keen follower. I’m not from Leeds or Yorkshire (although I found out after arriving that my Latham name is! ), and don’t really want to go to every game like some fan(atics) do. That’s probably partly down to the team not doing that well, the way football has gone in the last twenty years and my age too. If Leeds were doing well, it was still cheap to go, and I didn’t have other interests, such as this writing, I probably would want to go all the time!? I feel able to write this with Leeds in a mini-slump, in the hope that it motivates the team to return to form for a tough schedule of four games in ten days. Good luck! 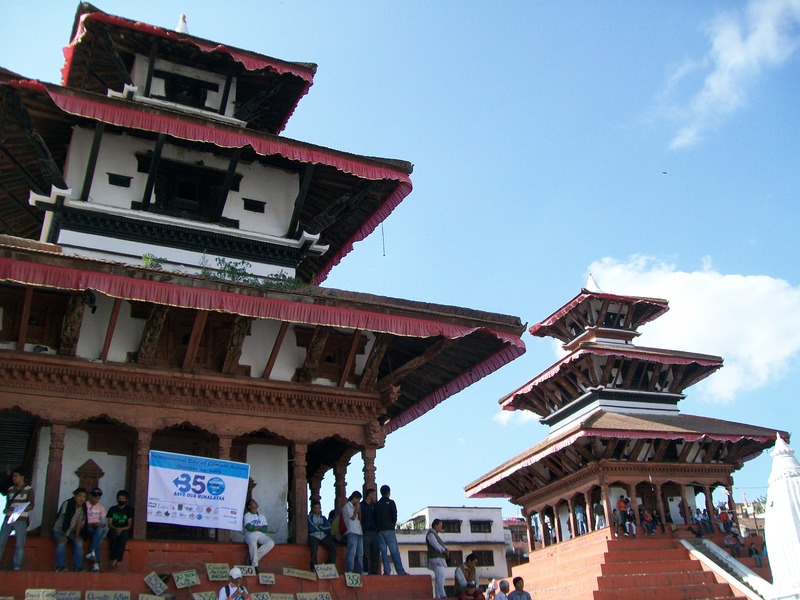 There was a 350.org environmental demo in Kathmandu’s Durbar Square, and I took a photo of it. It’s followed by a couple of videos with photos from the whole Nepal trip that were posted on YouTube to wrap up the Nepal leg of the t25y journey. Next stop is Cuba. In Tengboche I went to a Buddhist prayer meeting, with the temple open to trekkers. 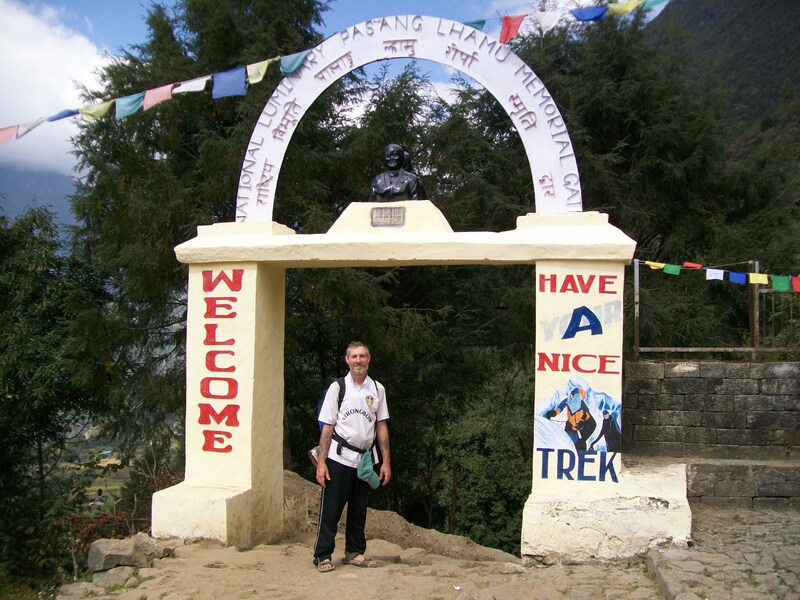 Lukla was like returning to modern civilisation, with bars full of happy trekkers, pub games and rock music. The flight from the ‘most dangerous airport in the world’ was smooth, and there were great views of the snow-capped Himalayas to the north as we flew through the valley seen earlier in the trek, and then over flat plains to Kathmandu. I think Lukla is just beyond and inside the third ridge on the right as you view. 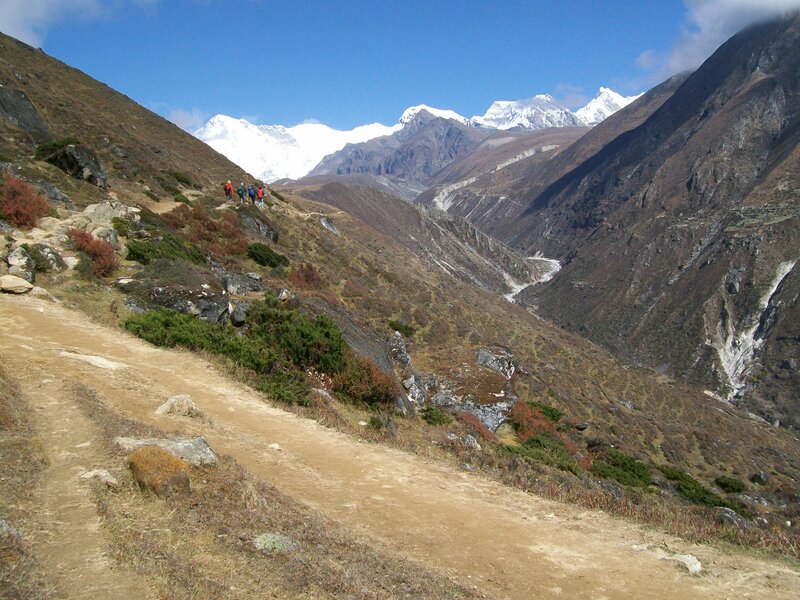 The trek path led all the way across the mountains on the right side of the photo, and then it was up to Namche Bazaar. The plane flies out of the ridge, and then back down the valley, before turning right to Kathmandu. 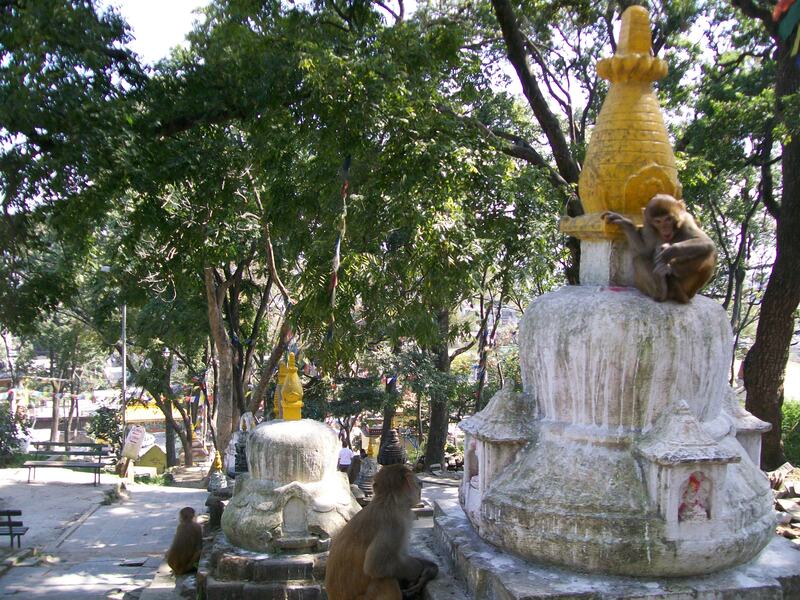 Back in Kathmandu, everybody said the Swayambhunath Monkey Temple must be visited, so I did. 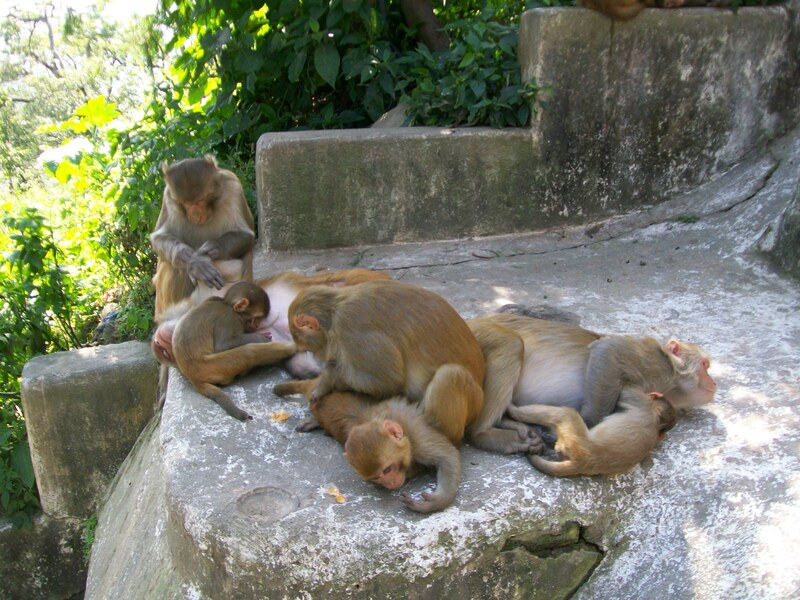 It was really nice, and had lots of cool and funny holy monkeys around the place. 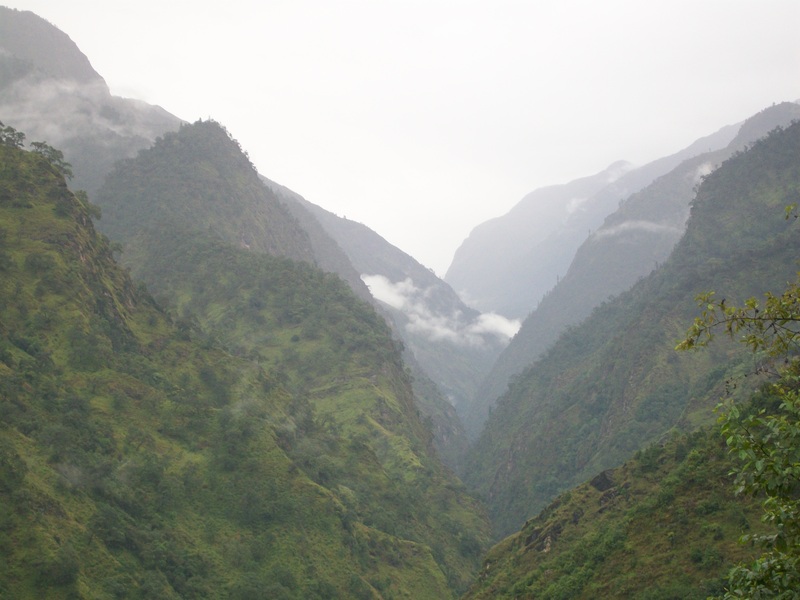 It is the most important pilgramage site for the Newars, who are the indigenous people of the Kathamandu valley. The next day was another relaxing one, and I just walked to the other side of the third lake, where there is a kind of beach. 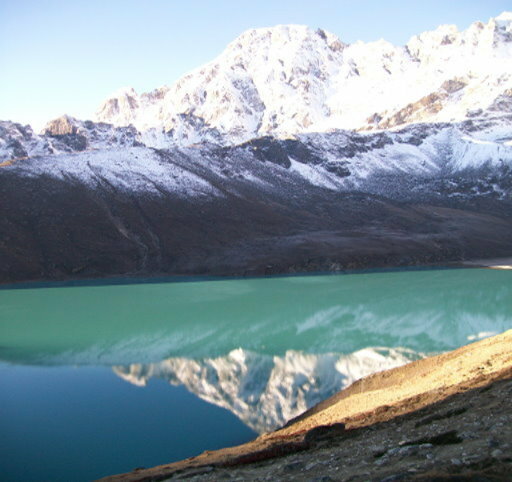 The first photo is looking back at the Gokyo lodges across the lake. 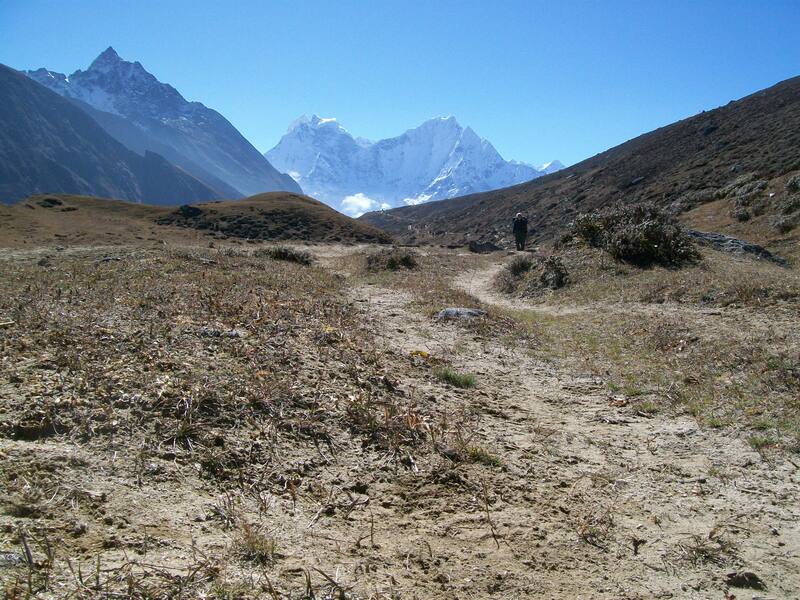 The next day I started the return journey; returning on the route of the outward trek until Phortse Tanga. 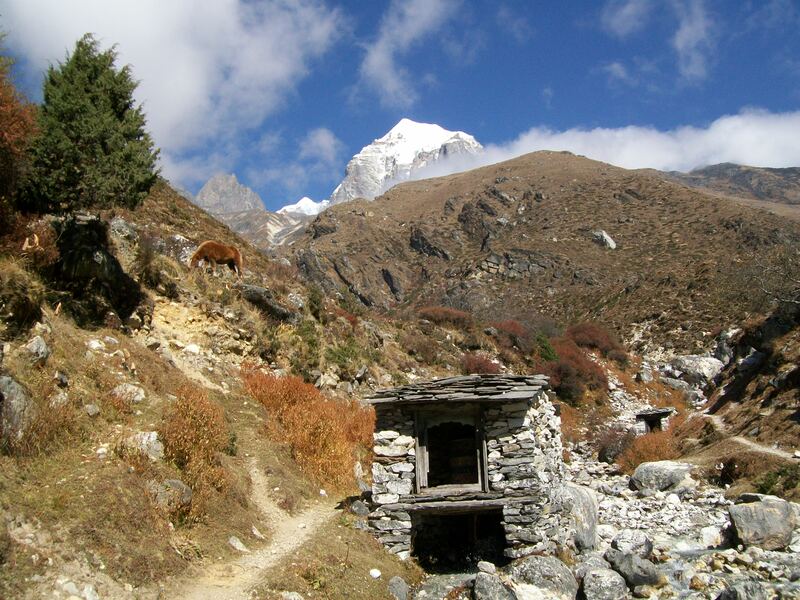 Then it was a left turn to Pangboche, where I overnighted at a lodge run by a Sherpa who had climbed Everest several times. There were photos of him on the peak in the dining room. The first photo below is of sunrise on the mountains in the morning. Looking up what mountain it is I today, nearly five years later, realised it’s the Everest range from the other side to Gokyo. Can you spot the horse in the second photo? 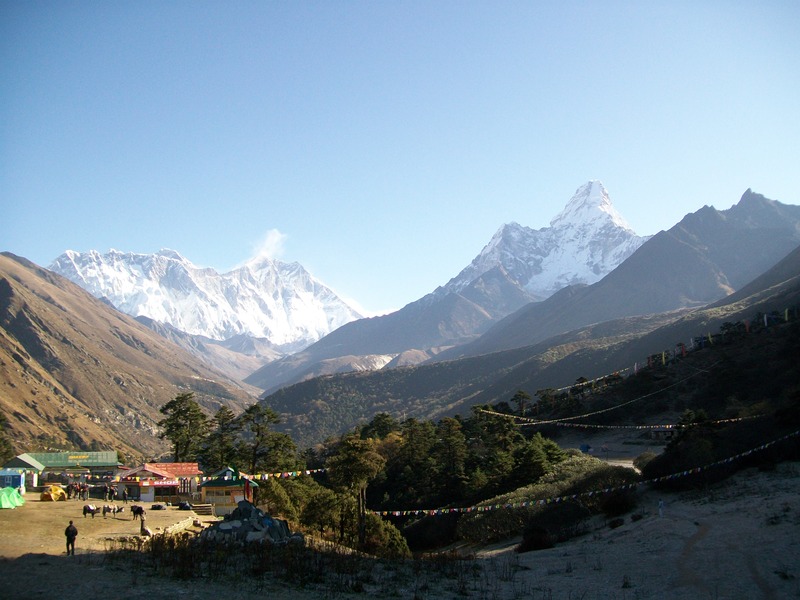 The third photo is looking back at Pangboche, with Ama Dablam to its side, and the Everest range behind it. 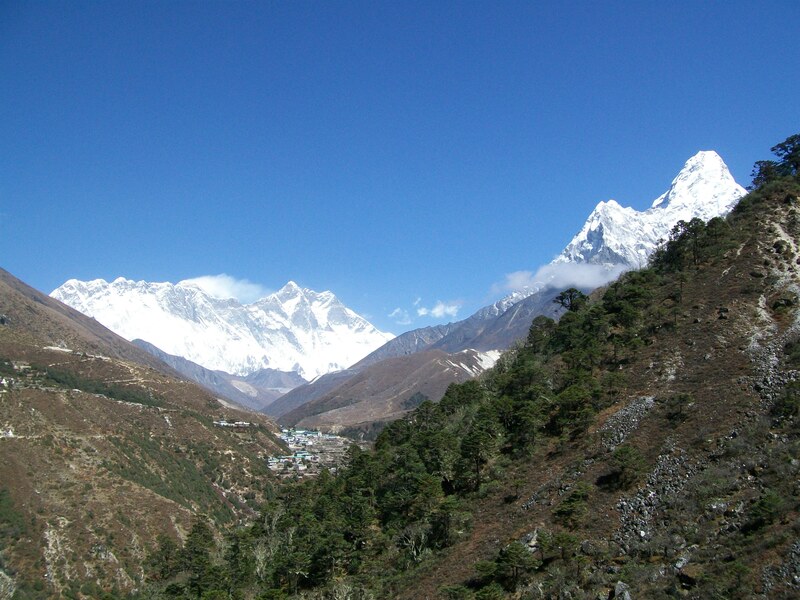 The first photo below also looks back at Ama Dablam and the Everest range, but from Tengboche, where I overnighted. 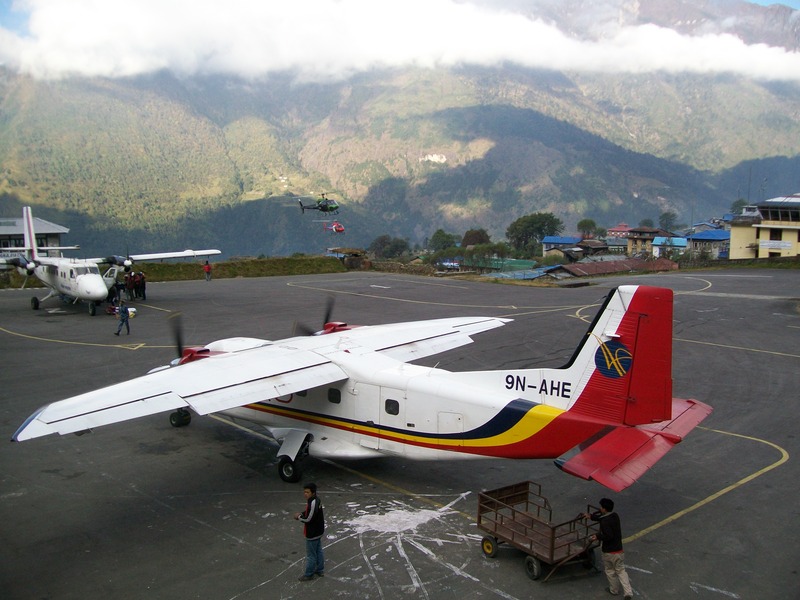 The final photo is from Lukla, which is either the trek beginning or end, or both, if you fly Lukla-Kathmandu-Lukla. 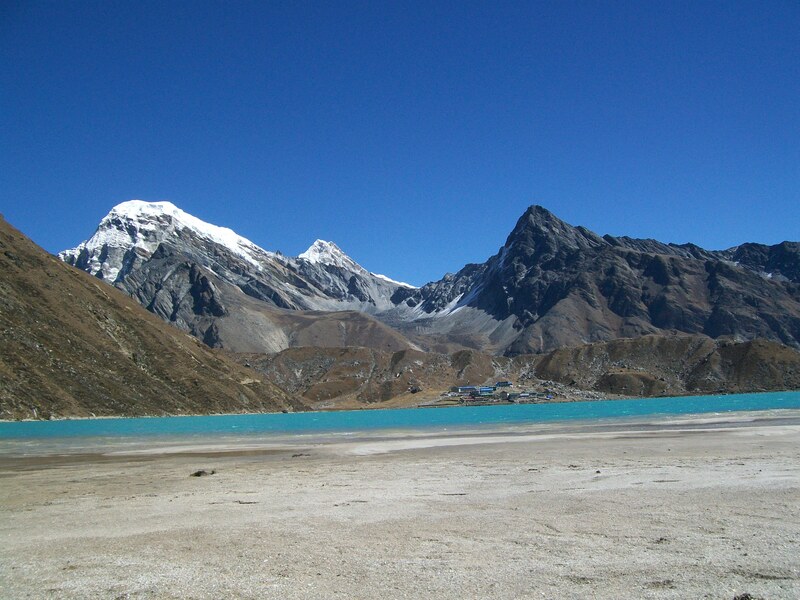 The day after climbing up Gokyo Ri I walked up to the last two lakes, which were jade rather than turquoise. 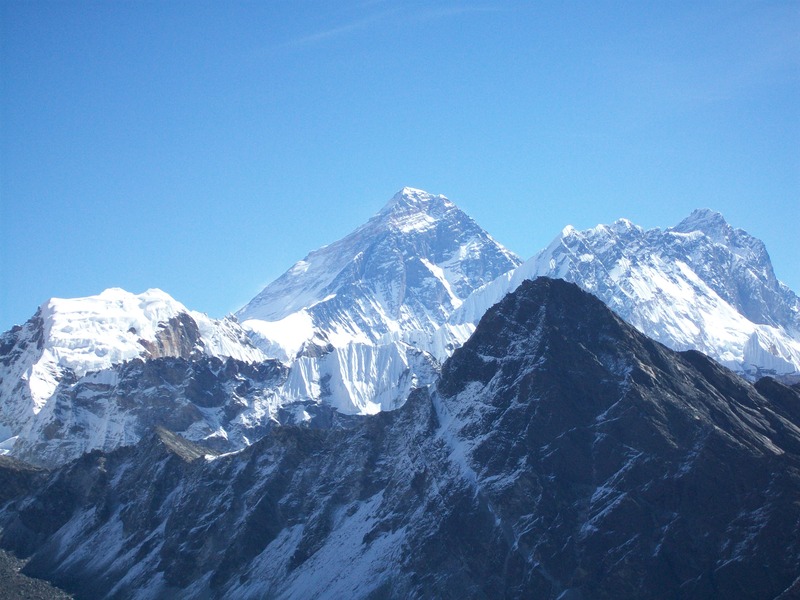 There was another view of Mount Everest along the way (photos 1 [right side as viewed, looking smaller than Cho-Oyu] and 3 [above Makalu]). 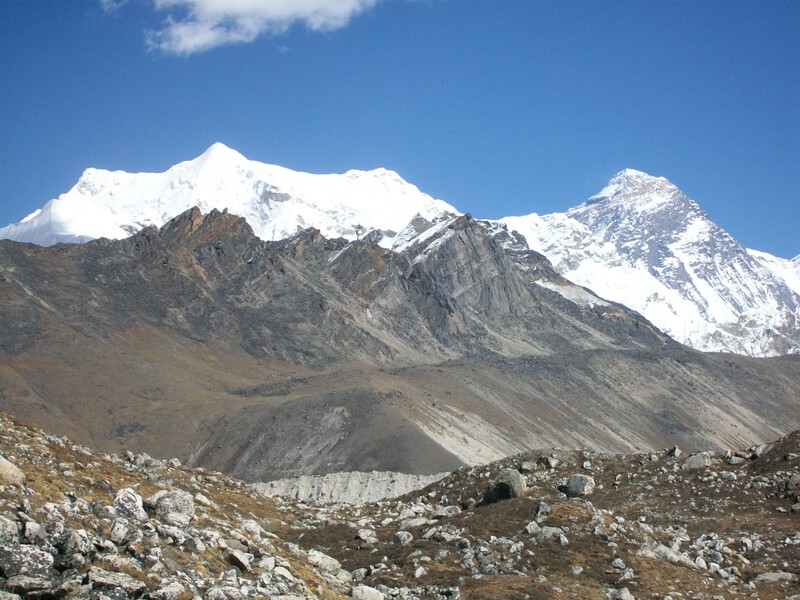 Between the track and Cho-Oyu / Everest was the Ngozumpa glacier: the longest glacier in the Himalayas. 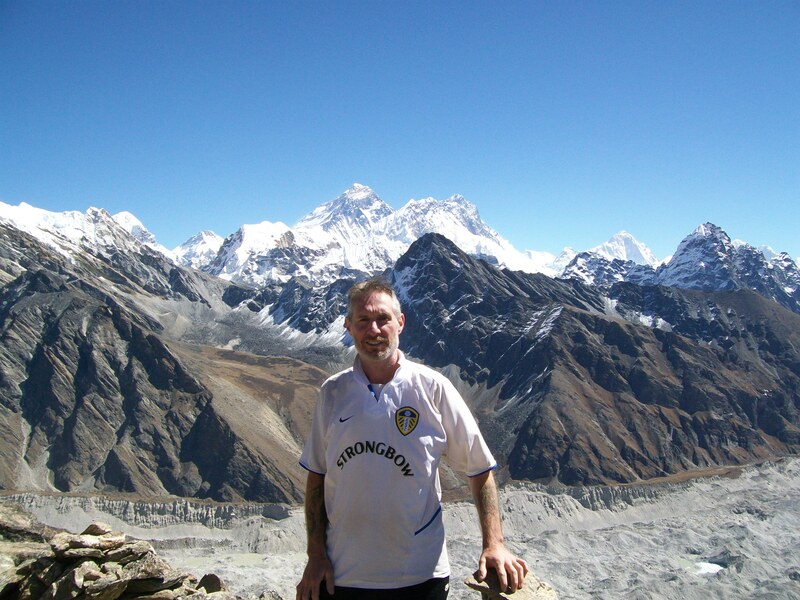 I had stomach problems in the morning, but was determined to climb Gokyo Ri (5,357 metres, 17,575 ft) to complete the Jiri to Gokyo 100-mile trek, and see Mount Everest. My description of climbing Gokyo Ri is mixed below with photos, and there’s a video from the summit at the end. 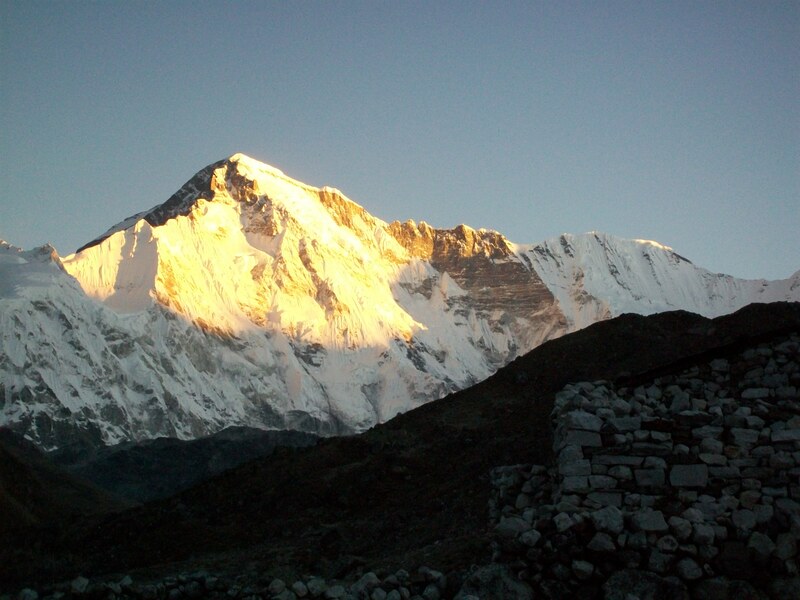 The sunrise looked stunning as it lit up Cho-Oyu on another beautiful clear morning, so I went out to take a photo. I left at about 7am. Stepping-stones crossed the stream running down from the north. I made it most of the way across, before putting a foot in the water. It could have been worse: a trekker I later met had fallen back into the water! 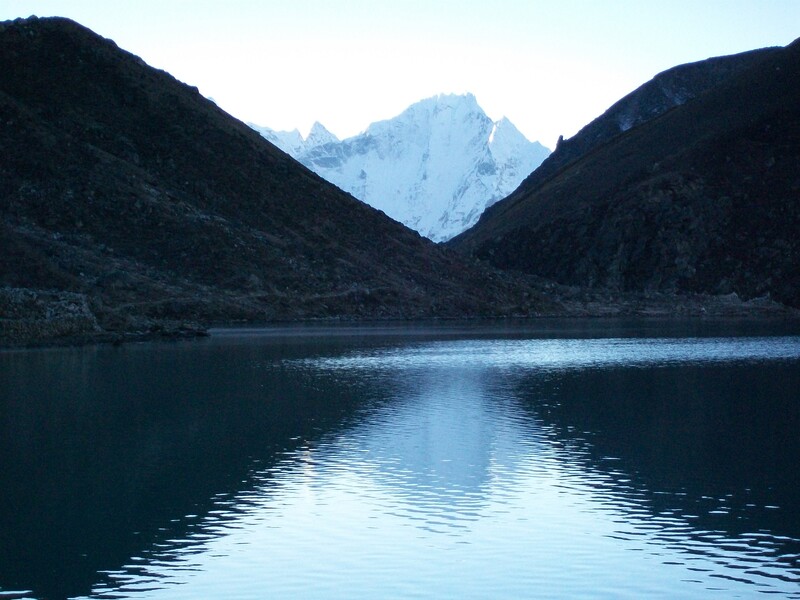 The lake looked amazing at the start of the climb, with the sun dipping a copy of Phari Lapche into it, mixing the water between blues and greens, and framing it with the real mountains and an illuminated Gokyo Ri. It was a steep climb from the start, and I missed the downhills I’d begun to resent earlier on the trek. However, any difficulties were outweighed by the stunning scenery being unveiled. 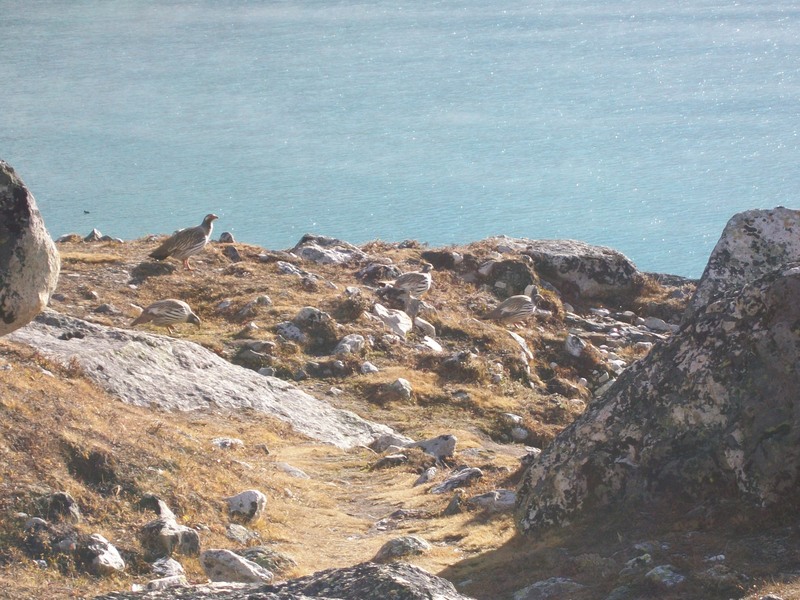 Looking back down the mountain, from one side of Gokyo Ri to the other, the scenery was one continuous arc of astonishment: the planet’s highest peaks shone under the sun framing turquoise lakes and a moonscape glacier. And then I could make Everest out! It was an amazing feeling to see the highest point on Earth, and fulfil the main objective of the trip. I reached the peak after about three hours, completing the mission part of the trek. It was certainly all worth it, with an amazing 360 degree panorama viewable from amongst the prayer flags and cairns. There was also a small Buddha statue there. 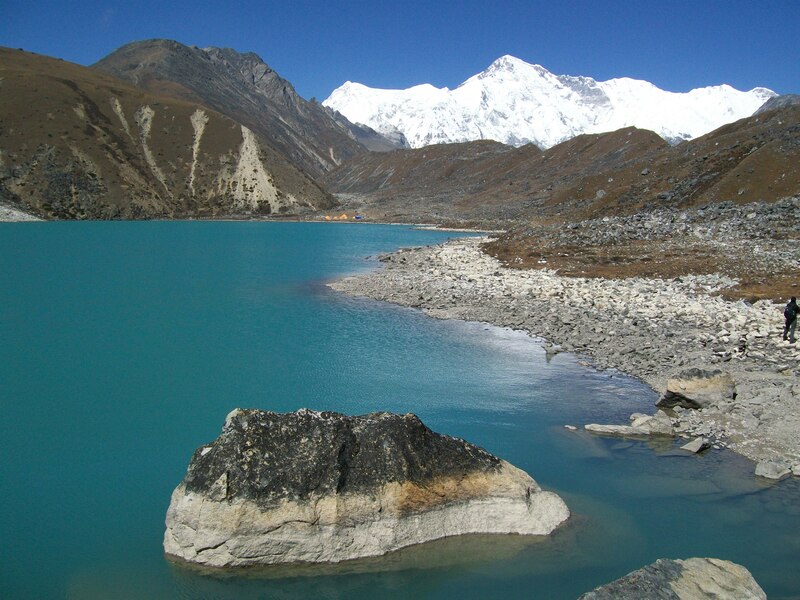 The fourth Gokyo lake was visible to the north: it was jade rather than turquoise. Small brown birds flew around freely, and looked quite tame when they landed. Walking down was nice, although a little sad to know it was all over, and the rest of the day was spent relaxing and savouring. 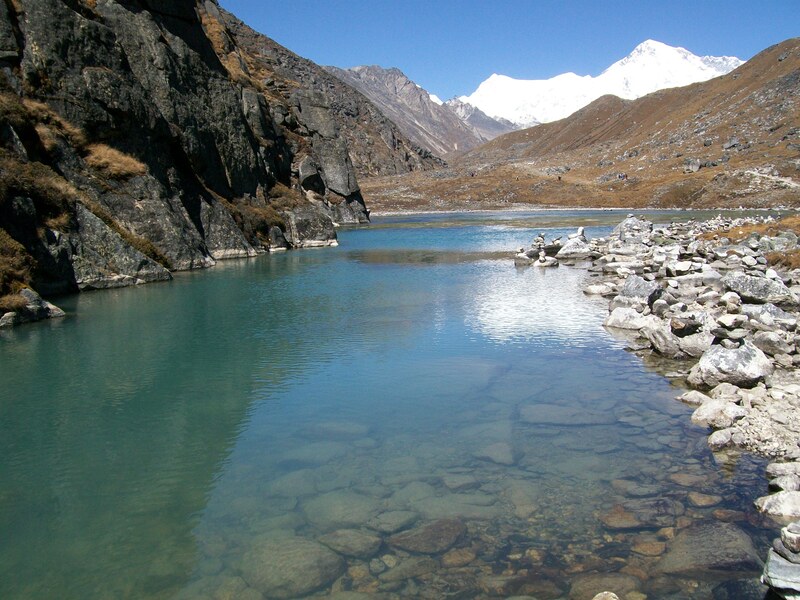 Gokyo village (4750 metres, 15,583 ft) is basically a few guest houses on the banks of the third Gokyo lake. It was the end destination of the trek, about 100 miles from its start point in Jiri. Towering above the lake is Gokyo Ri (5,357 metres, 17,575 ft), which provides excellent views of Everest. The third lake was not far away, and it was a delight to see it on the track’s left at about 1pm. I washed my face in the water, and threw a stone in to celebrate. Gokyo Ri towered above the lake to the north. The village was straight ahead, on the eastern edge of the lake. Some mist started coming off the lake at about 3.30pm, and more cloud drifted down from the north. The sun started setting above Phari Lapche and Chadoten mountains just after 4pm, and disappeared behind thick cloud over the mountains at about 4.30. Alpine snowdrops lit up the ground, mirroring the sunny clear sky. 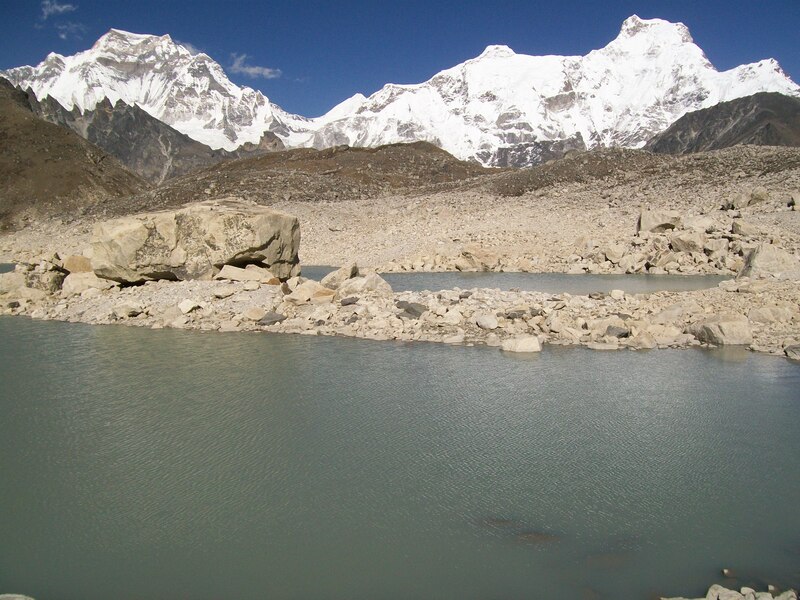 Then, ten days into a Jiri-Gokyo trek, the first Gokyo lake came into view. 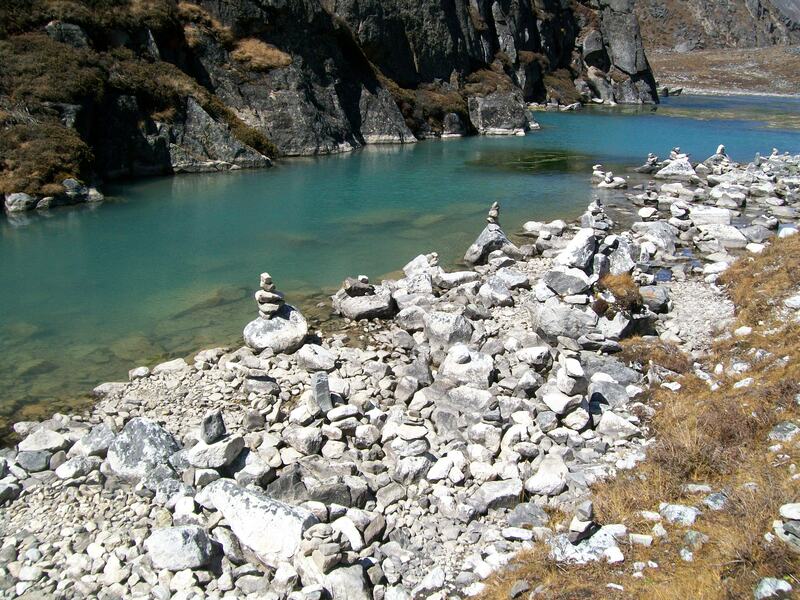 It was great to reach the first Gokyo lake, and I built a cairn amongst many. 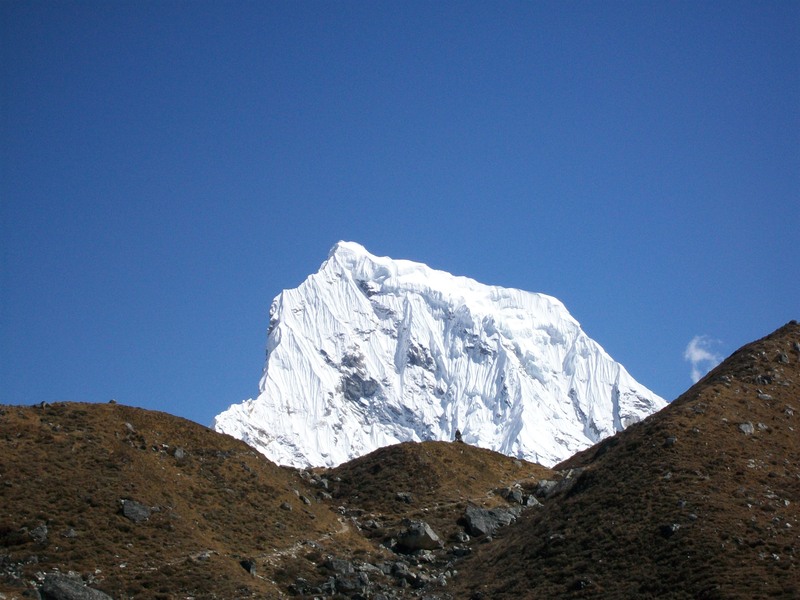 The fourth photo is of Cholatse, with its distinctive steep northern face. I climbed over a couple of rocks to get the fifth photo of Gokyo’s second lake from its southern end. On its northern edge are the orange tents of a climbing group. Cho-Oyu is in the distance, as it is in the second photo. My Stockholm article from the Norway – Sweden trip that ended the twenty-five years of travel featured in this blog, and started off this blog, has now been published on travelthruhistory.com. 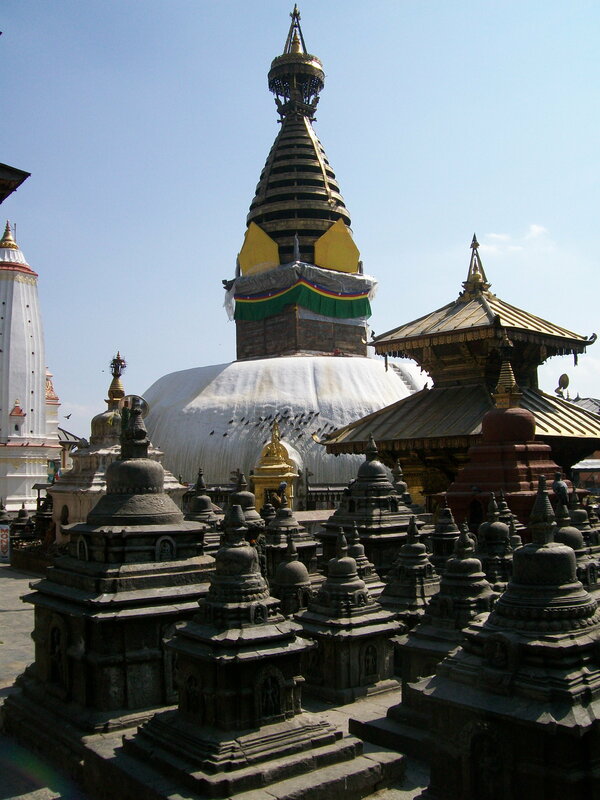 The main article in this month’s issue of the website is about Kathmandu, Nepal. My Nepal journey started in Kathmandu. 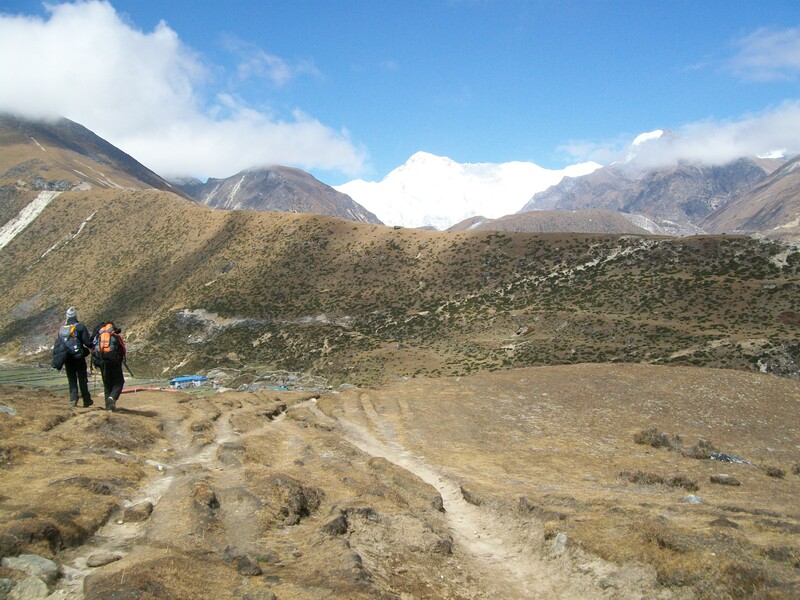 I took a bus to Jiri and trekked for about a week to the Everest national park. 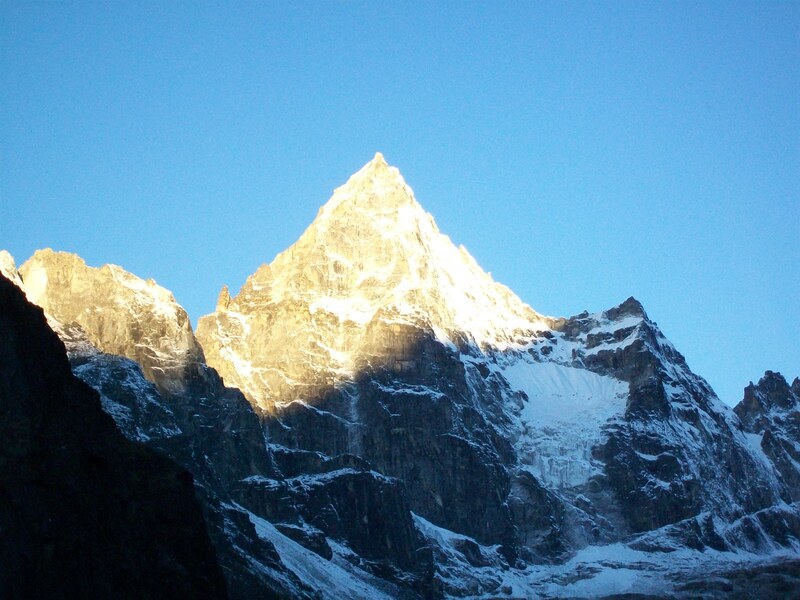 I had now reached Machhermo, a day away from the target destination of Gokyo. A night trip to the outside toilet revealed a clear sky full of stars. 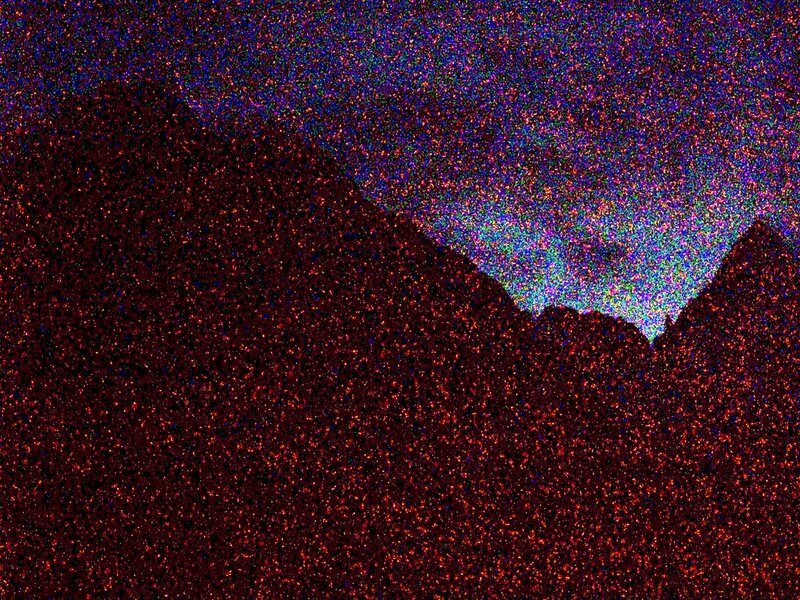 Moreover, the mountains were silhouetted, and I tried to take a photo of them. 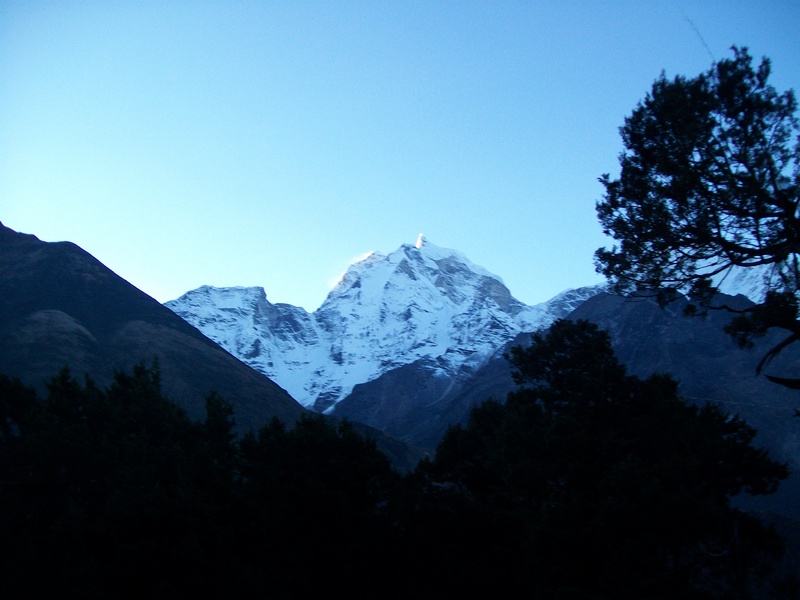 I also took some photos, posted below, starting with Machhermo Peak from the village in the morning. 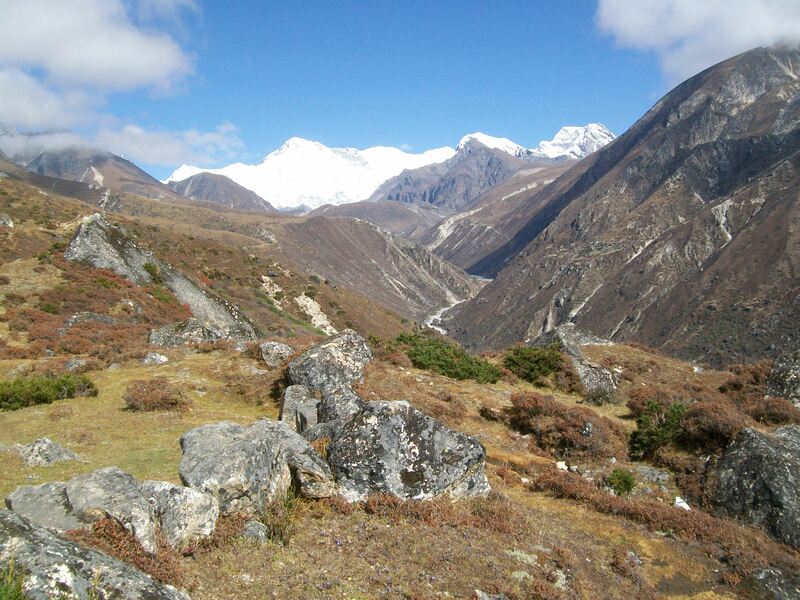 The second photo looks back down the valley, with Thamserku and saddle-peak Kangtega in the middle distance. 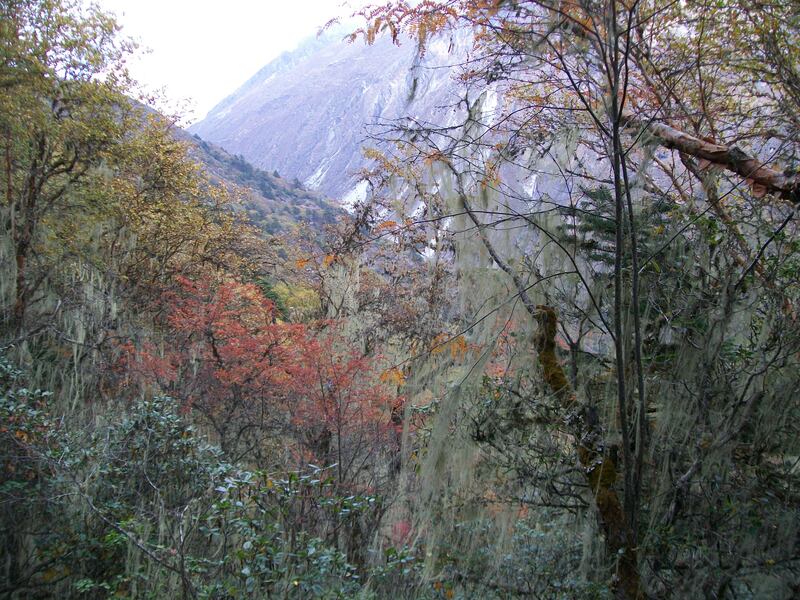 The steep sided mountain in the third and fifth photos is Cholatse. Its southern neighbour is Taboche. 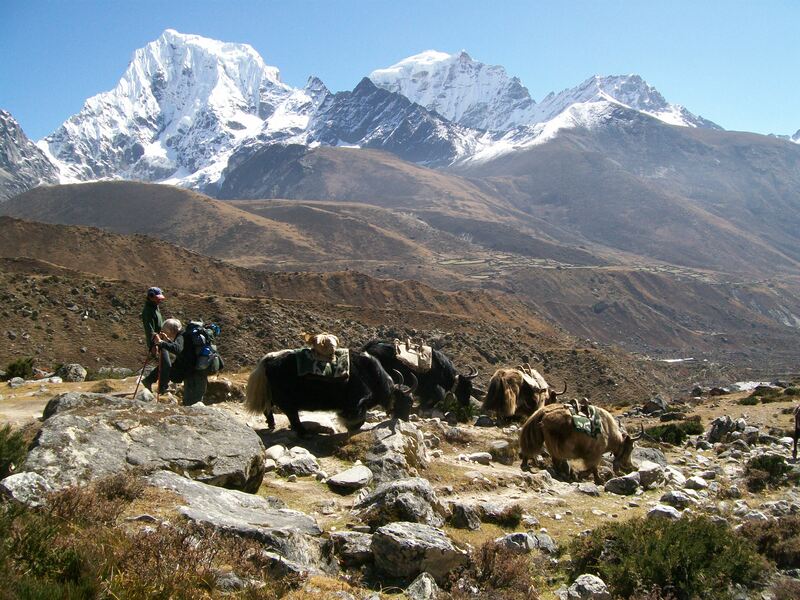 A hiker passes a yak herd in the fifth. All five of those mountains are between 6000 and 7000 metres. 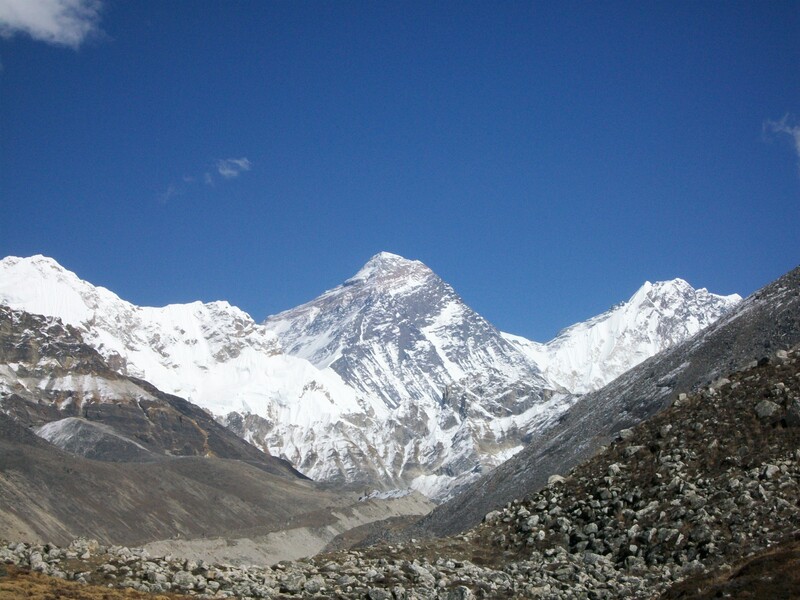 Everest is about 8800 metres. 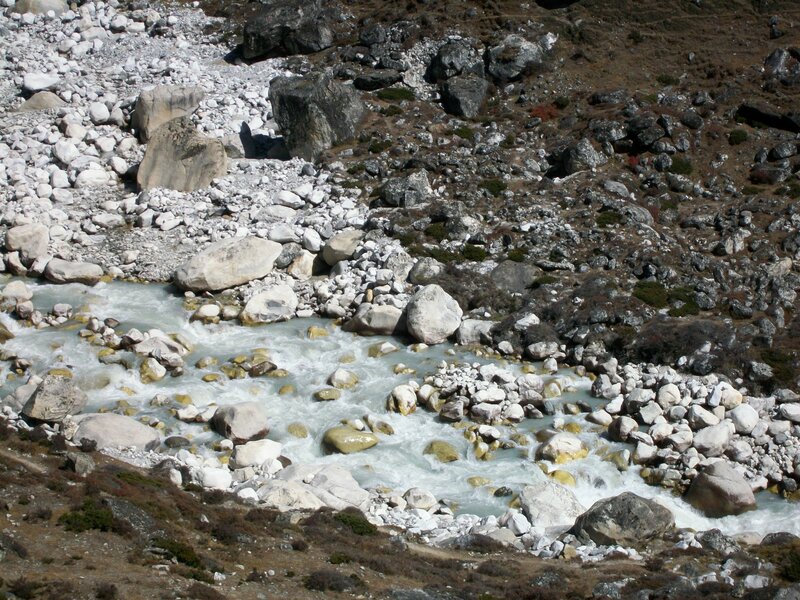 The fourth photo is of the Dudh Koshi river, running through the valley. It was a few hours of enjoyable walking to Gokyo, and the next blog will feature photos of Gokyo’s lakes as the destination is reached. The Norway third episode of the Channel4 Scandimania television series started off in Bergen and then travelled to Voss and Bergen by train like Marc Latham on his Norway-Sweden journey that ended his twenty-five years of travel and started this blog. It’s available from the link above, but just in the U.K. I think. After two nights and a day in bed, I managed breakfast before setting off on the last full day of trekking from Jiri to Gokyo. I went straight to the toilet afterwards, but the sickness had mostly passed, and I didn’t need the toilet again. My previous travels had told me it was just mild food poisoning, with a lunch stop between Namche and Dhole the likeliest source. The first night had been feverish, while the next day and night were just tiredness and recovery. After an initial incline the day’s trek was quite steady, with great views over the valley below and up to the mountains above them. Arriving in Machhermo (4400 metres) around noon I went to an informational presentation put on by the medical centre about avoiding altitude sickness at 3pm. It was an entertaining talk, and they tested a full room of trekkers for oxygen saturation. Everyone was okay. A new medical student had been helicoptered out that afternoon with altitude sickness! 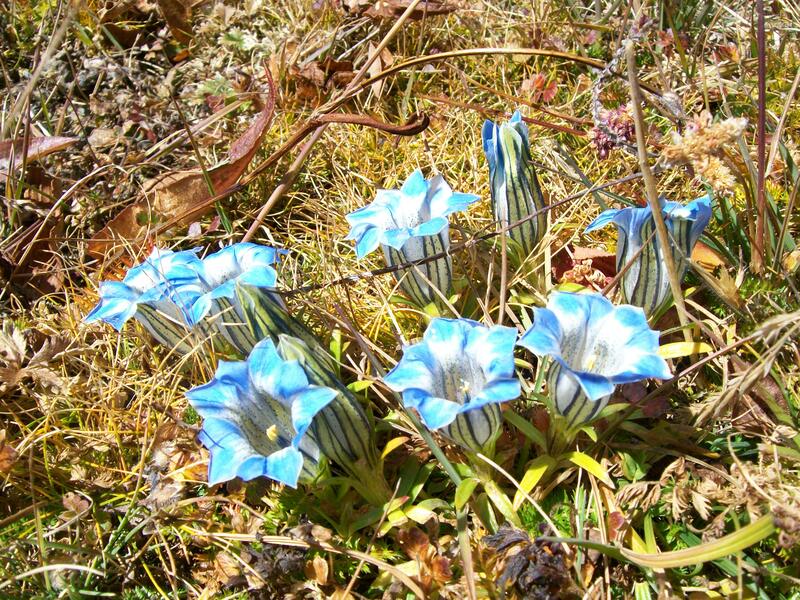 The first photo below was from the previous day’s trek, between Namche and Dhole. The colours reminded me of the U.K., and the autumn underway there. 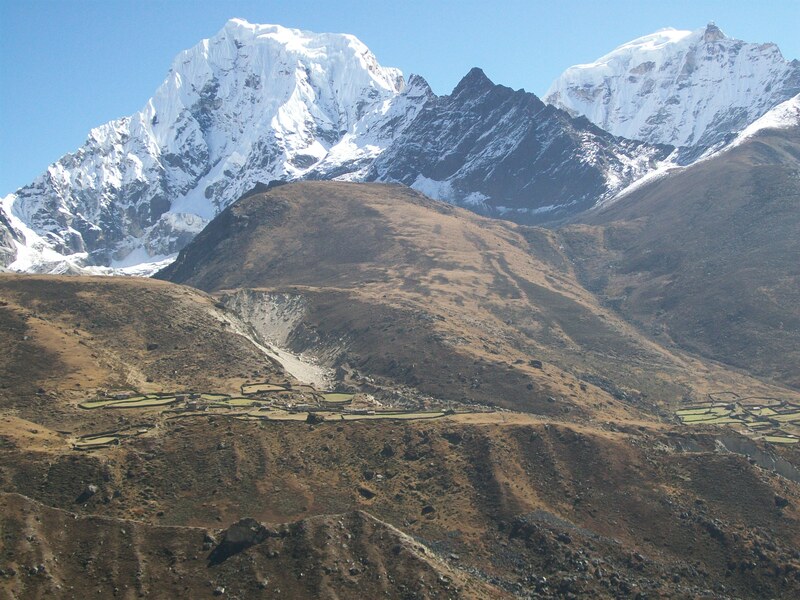 The mountain at the end of the valley in the lower photos is Cho-Oyu, which is the sixth highest mountain in the world. 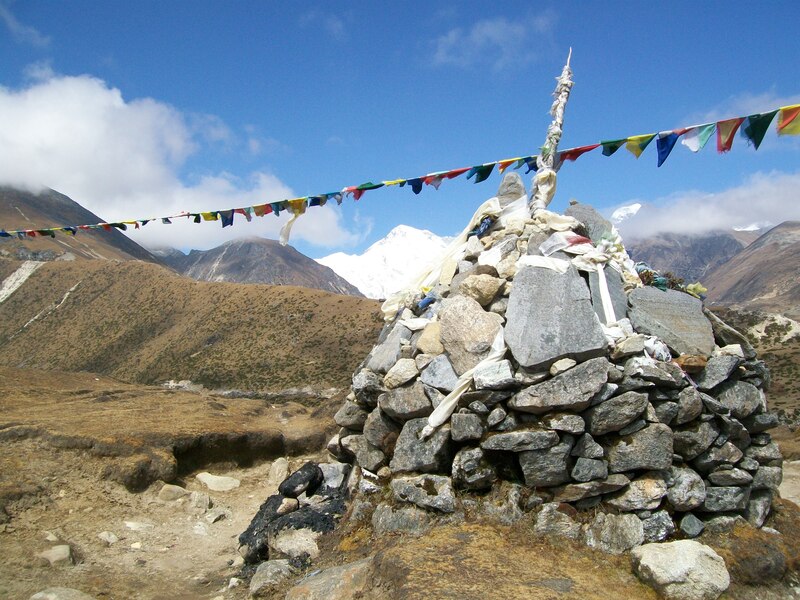 It marks the border between Nepal and Tibet/China. I didn’t know that at the time, or that Gokyo was before it. I think it is Machhermo visible below the hikers in the last photo.